It’s always good to have some quick, easy and tasty recipes up your sleeve if you feeding a crowd. I know how it is difficult to decide what to pair up with what in as far as a starter, main and dessert is concerned. I always find it helpful in cookery books when they give suggestions. It’s surprising how many do not actually do this! Both these recipes turned up on my blog when I first started back in 2011 and I felt that the photos needed a little improving so decided to re post with new ones that I recently took. They are both definitely ‘go-to’ recipes for me. 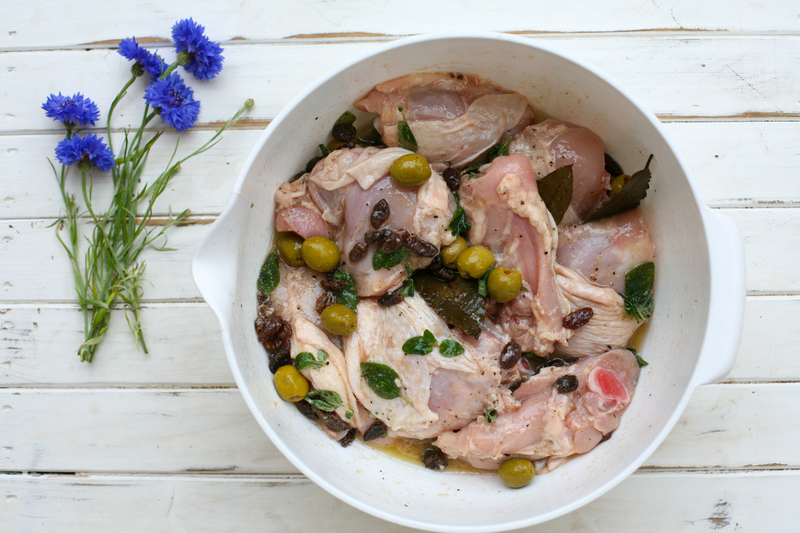 Hearty food with wonderful herbs, but light and fresh – perfect for summer days. They are so quick and easy to prepare that if you have friends coming over or you are doing your own catering on holiday, they take no time and will not cause you any stress. The dessert I accompanied these dishes with was Rose and Summer Berry Skinnifreddo, which I found on fellow food blogger Kellie’s blog – kelliesfoodtoglow.com. It was wonderfully fresh, colourful and healthy and complements my starter and main beautifully. Her blog is really rather lovely so do take some time to look around it – I am sure you will be inspired. 1. 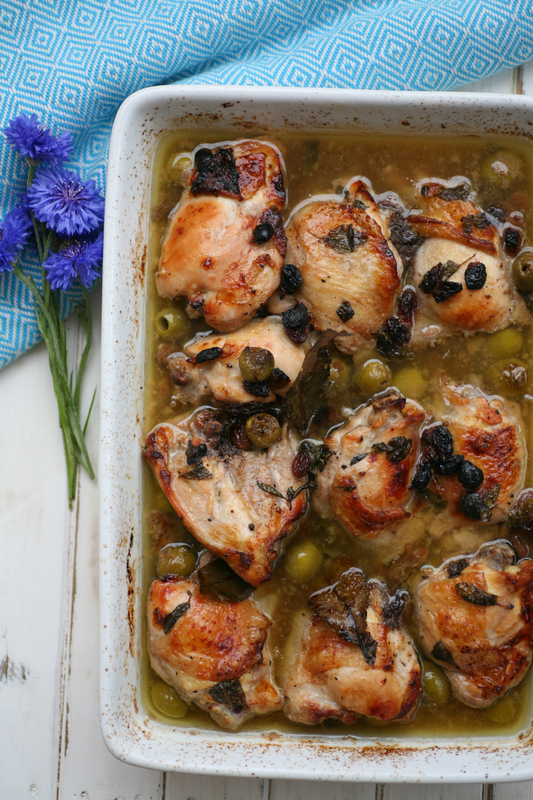 Cut the excess fat off the chicken thighs, pierce the skin with a fork and place in a large mixing bowl. Then add all the ingredients, except the white wine and brown sugar, to create the wonderful marinade. You don’t have to stick rigidly to the amounts for the olives and raisin/sultanas ingredients – if you love olives throw in a little more and same goes for the raisins/sultanas. Really mix all the marinade thoroughly over the chicken using your hands. Cover with foil and place in the fridge overnight or for as many hours as you can. 2. 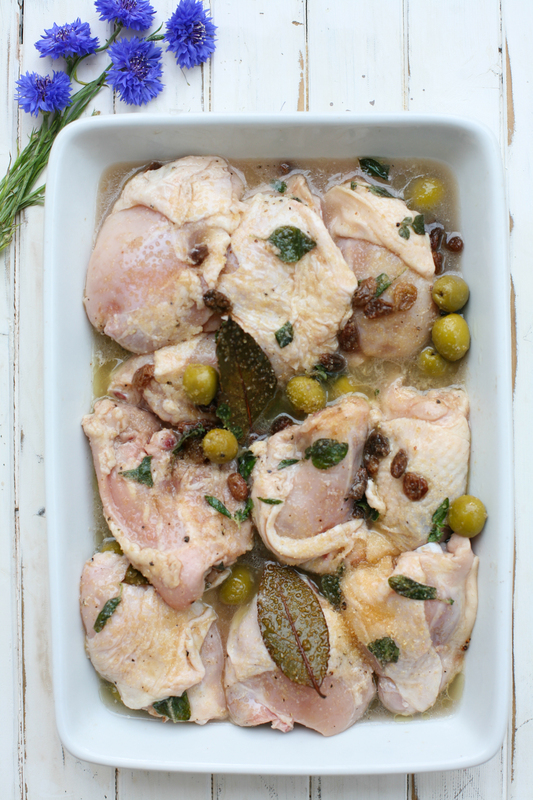 Transfer the chicken and the marinade to an oven proof dish. I often use a couple of dishes so that the chicken thighs are evenly spread out. Then pour the white wine and sprinkle the brown sugar over the chicken thighs. 3. Place in a pre-heated oven at 180 degrees centigrade for 50 mins remembering to spoon the marinade over the chicken during cooking. This will ensure the chicken has a golden brown glow when it is cooked. 1. Melt the butter slowly in a pan, careful not to burn the butter. When melted add the sliced spring onions and stir into the butter for 5 minutes. Stir in the peas, vegetable stock and mint and leave to simmer for around 20 minutes (30 minutes if you are using fresh peas). 2. Puree the soup to the consistency that you require. Then add in the milk – if you like a thicker consistency then add less milk than the amount given above. Season to taste with salt and pepper. 3. Immediately before serving sprinkle each portion with crumbled feta. 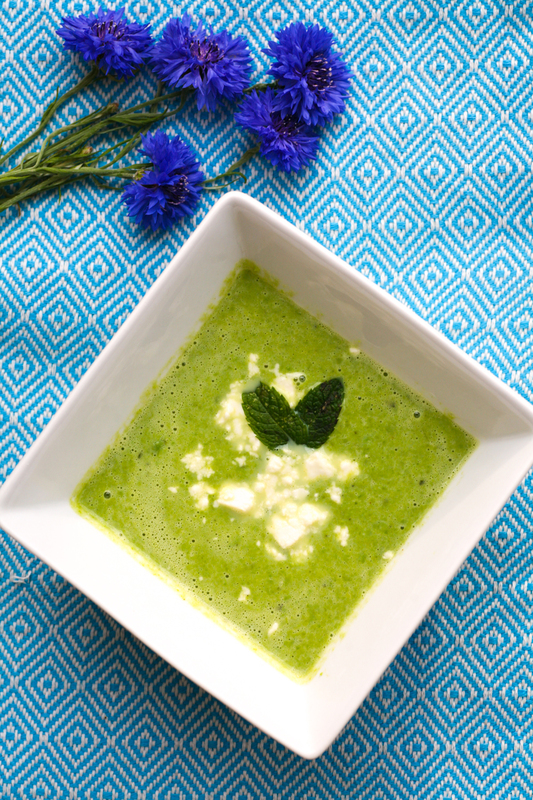 This entry was posted in Chicken, Vegetable, Vegetarian and tagged chicken, feta, lunch, mint, pea, quick, soup, summer. Bookmark the permalink. I love a good baked chicken recipe. The spinach must make it healthier! Hello Torie, I love your blog. Your recipes always seem so fresh and exciting. Your kitchen table must be glorious place. I’m going to try this chicken recipe on Sunday night when I know I will feel quite overwhelmed by the idea of cooking again. Why garlic powder rather than slices of garlic? Thank you for your lovely comments Camilla. If you don’t have garlic powder, don’t worry, finely chopped or thinly sliced garlic could be a good alternative as well. Let me know how you get on. Hope it gets the thumbs up from your family. Like the soup. V cool. Baked chicken must be delicious.